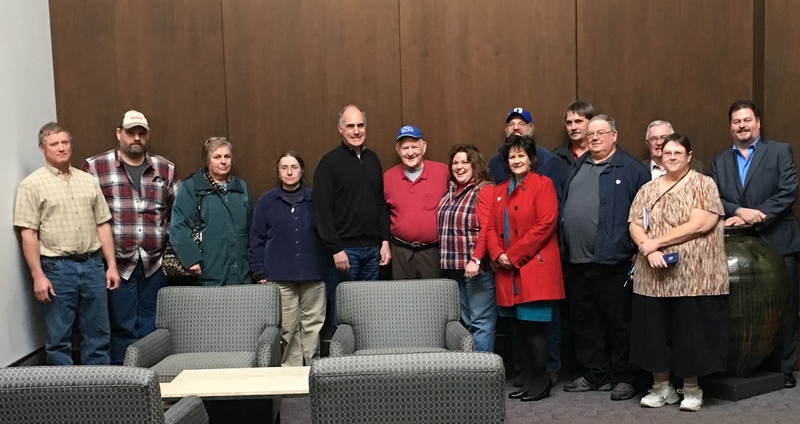 On Sunday, January 31 Senator Robert P. Casey, Jr. (D-PA) met with several dairy farmers and two county commissioners at his headquarters in Scranton, Pennsylvania. This will be nearly $9 per cwt. (90cents per gallon) less than the average price of $24.28 in 2014. The Pro-Ag officials claim the severe plummet in milk prices can be blamed on an inadequate, inferior milk pricing formula the USDA uses to price milk to all dairy farmers. According to Pro-Ag, the formula does not consider the dairy farmers’ cost of production, but the formula does contain a make allowance that is geared to cover the milk processors’ cost of converting milk into manufactured dairy products. The dairy farmers present responded loud and clear that they are tired of paying high hauling costs to have their milk transported to the milk processors’ plant. They were also vocal regarding the US Congress for mandating that all dairy farmers pay 15cents per cwt. to advertise their milk. Other dairy farmers are paying some high costs to their dairy cooperatives to have their milk marketed. In addition to the extreme low milk prices, the above costs are deducted from the dairy farmers’ pay price, so in essence, the $15.50 estimated pay price will be around $13.50 per cwt. for many dairymen. According to Tewksbury, these prices are unbelievable, and something must be done and done soon. Pro-Ag is urging a $20 per cwt. floor price be placed under all milk used to manufacture dairy products, and they are urging the USDA to immediately develop a new pricing formula that will allow dairy farmers a fighting chance to cover their cost of production plus a reasonable profit. Everyone in the room had a chance to address Senator Casey. Chris and Linda Broyan whose farm is in Berwick, Pennsylvania, (Columbia County) who milk nearly 500 cows, reported that the farm is a true family farm, with nieces and nephews working together in an attempt to maintain their farm. Chris Broyan tearfully told the Senator he doesn’t have time to spend with his two young children. Brenda Cochran of Westfield (Tioga County) drove over three hours to be present at the session. Brenda shared many stories concerning the hardships her family experiences on her farm and in her rural community because of the low milk prices. She strongly supports federal investigations into the current dairy policies to include examining the role Capper-Volstead dairy cooperatives have played in milk pricing and the marketing of milk in the Federal order system. Tom Henry, Wyoming County Commissioner, and Betsy Arnold, newly elected Susquehanna County Commissioner, were present and both made strong presentations in support of the needs of their dairy farmers in their two counties. As the meeting drew to an end, Pro-Ag officials strongly urged Senator Casey (a member of the Senate Ag Committee) to become a spokesperson for all dairy farmers in Washington DC and asked the Senator to take the initiative to correct these problems in Washington. The session ended with Annette Kuzma relating a story concerning their 13 year old son, asked by a neighbor the three most important things he would like to become. His answer: a professional baseball player, take over the family dairy farm, and a judge. Why a judge, son? He answered: So I could punish all the people who are mistreating dairy farmers! This entry was posted in Blog, Press, Releases and tagged Congress, Dairy, Fair Prices, Federal Milk Market Improvement Act, USDA. Bookmark the permalink.